I am a huge fan of The Conjuring (2013). I feel as though it was a perfect balance of terror and eeriness, whilst encapsulating all of the most successful horror tropes. The Conjuring 2 was just as brilliant, creepily introducing the demon Valak into the universe. When I first heard that there was going to be a film purely based on the demon, I was both terrified and excited, thinking about what it would be like. From the trailer I couldn't wait to see it and perhaps find out a little more about why the demon has taken the form of a nun. As the film began, Matt and I sat in the cinema on the edge of our seats. Set in a convent in Romania, two nuns are seen to be wandering the dark halls, about to open a door which states 'God ends here'. 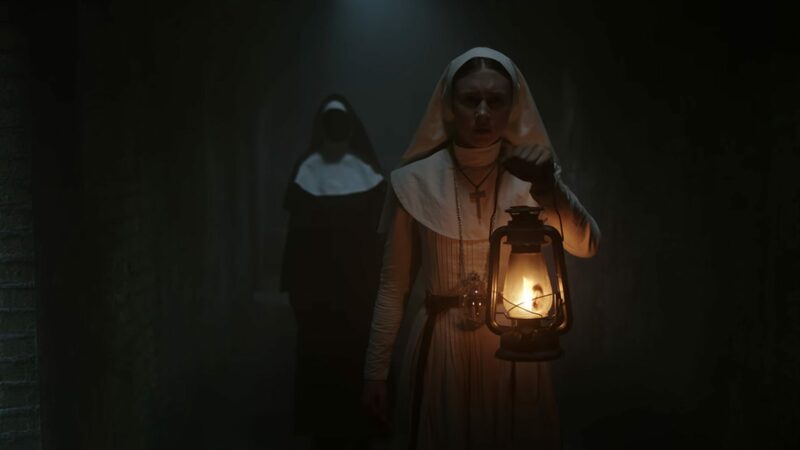 As one is dragged into the dark, she says something along the lines of 'you know what you must do' to the other, leading to the nun taking her own life so that the demon can't possess her soul and use her as a vessel. A young man then finds the deceased nun, leading to the vatican somehow getting involved and a priest (Demián Bichir) and a young nun (Taissa Farmiga) being made to go and investigate the murder. This was all very promising. It was creepy, we only got a glimpse of Valak and the story seemed to flow well. From then on however, it all went downhill. As the film continued, some paranormal and terrifying scenes occurred, but for the most part, it was simply too OTT and fell down the rabbit hole of too many obvious jump scares. What I found the most terrifying about The Conjuring 2, is that you hardly saw Valak, or when you did, it was done in a way that was bone-chilling. With The Nun, I found it was way way way too much — resulting in the demon becoming less scary by the minute. It also had some obvious twists that bugged me and made me feel as if it was lazily written. Yes the acting was for the most part good (I liked how they cast Vera Farmiga aka Lorraine Warren's real-life sister in the film - even though she was not connected to Lorraine) and the directing isn't bad (it was directed by Corin Hardy, also known for The Hallow), and it did end by showing a scene from the original Conjuring that tied the film together, but I found that for the second half of the film that I was huffing at the ridiculousness of it. Matt and I found it particularly funny when each moment Valak would appear, they had this booming 'waaaaaaa' sound which was less scary and made me think "oh for god sake go away". I wouldn't recommend this for fans of the franchise as I think it missed the bar completely. It's frustrating as the others are so good (shoutout to Annabelle as well as that's entertaining) and it had the potential to be better - the story just needed rejigging and Valak to be less prominent. Therefore I would give this 2*/5...and that's being generous.